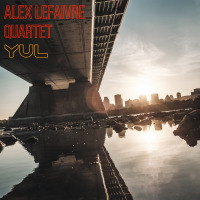 Bassist and composer Alex Lefaivre‘s YULis named after the airport code for the Pierre Elliott Trudeau International Airport in Montreal, Canada, and the liner notes say the release was inspired by his home town and its cosmopolitan vibe. Like the fun-loving city, the album’s sound is contemporary and imaginative. YUL is characterized by creative musical chops and a strong sense of composition that create a narrative out of each song. It’s contemporary jazz with a few unexpected turns along the way. “The Righteous” is languid and dreamy, with the instrumental lines weaving in and out of each other. Each is allowed to create texture between the notes, and the results are compelling. A cover of the theme for John Carpenter’s seminal horror flick “Halloween” is a surprise addition to the sophisticated set of tracks. Lefaivre’s treatment disconnects the ear worm harmonies and spotlights the nimble work of Erik Hoveon alto sax and Nicolas Ferron on guitar in long improvised sections. Drummer Mark Nelsonadds a distinctive element to the ensemble with a steady stream of pure invention that holds the beat while playing with its parameters. Lefaivre’s own playing is both judicious and decorative where it needs to be, a loose thread that anchors the music. “The Juggernaut” is a highlight of the release, a tense and insistent composition that builds to a mesmerizing trance-like effect. “Nostalgia,” not suprizingly, tips the hat to old school mid-century jazz with a three-o’clock-in-the-morning kind of feel. Lefaivre is perhaps best known as one of the founding members of Parc X Trio, an award winning jazz ensemble also based in Montreal. In YUL, his compositions make good use of the power of a quartet to create multiple textures and moods, and each instrumentalist is given room to take center stage within a tight and cohesive unit. A variety of approaches and high octane musicianship keep this release fresh and interesting.